When people visit Curaçao they look up places to stay, things to do, what to eat and where to eat it. People often forget all the local drinks we have to offer, which is an absolute pity because they are as delicious as our local dishes. The best thing is that there is no reason to choose just one. Drink them all! You will see how much one drink can improve that vacation feeling we never want to let go of. Amstel Bright and Brion are not actually brewed on the island, but they are brewed with the island in mind. The first Amstel Bright was brewed on the island, but nowadays, it is brewed in the Netherlands and primarily in the Caribbean. Amstel Bright represents the island vibe. The beer has a light and fresh taste which is perfect for laid-back moments. 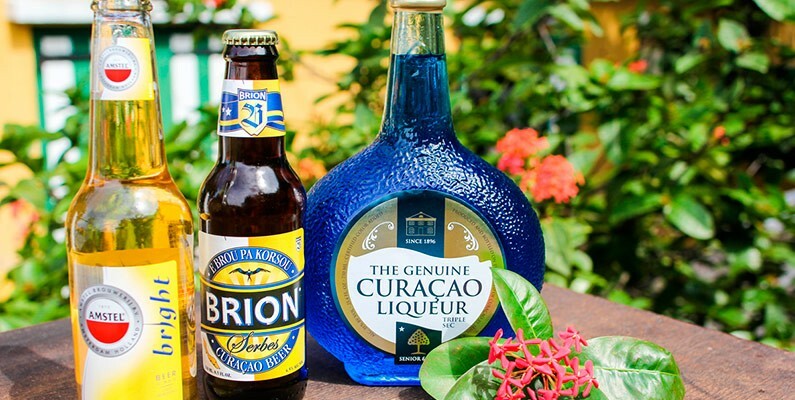 Brion is named after Curaçao-born admiral Pedro Luis Brion that fought many battles for freedom and human rights. Now with every sip we take of this local beer we celebrate his legacy and the island’s history. Everyone knows Blue Curaçao. Senior Liqueur offers premium craft Curaçao Liqueurs that originated on the island and are still made in Curaçao. The Senior Liqueur is made of real Laraha peels that can only grow on the island. You can get a taste of this genuine Curaçao Liqueur at Landhuis Chobolobo during a tour or just by taking a seat in our courtyard. Just like coconuts are a typical Caribbean fruit, coconut water is also a Caribbean drink. There are many ways to get coconut water on the island, but since you came all the way here you should drink it the proper way—from the fruit itself. Go someplace where they chop it open right before your eyes. There is nothing like a fresh coconut! On Curaçao, limes are easier found than lemons. That is why our lemonade is made with limes instead of lemons. It's the best drink to have when the sun gets the best of you. Pour it over lots of ice and just sit back and the lemonade cools you down. There are a couple of restaurants that sell fresh lemonade, but if you want to stash your hotel room or apartment with this drink, you can always buy a couple of bottles at a supermarket. We have our own beer, our own lemonade and our own soda. Fria is a locally made soda that comes in a great variety of flavors. The sweet and refreshing taste of this soda makes it a popular drink among locals. Try the Kolita (red), which is one of their unique local flavors. The sweet name of this juice perfectly matches its taste. Lovers is a local brand sold all around the island. They have a variety of products, of which one is their juices. They come in different flavors and all of them are delicious. You will often see locals buying this drink in the morning when ordering their Pastechis. But, not only locals have a thing for this juice because tourists also do fall in love with it. Hence the name, Lovers! Have you tried any of these drinks? Which one was your favorite?